If I am honest, the fundraiser makes me feel extremely uncomfortable. This isn’t me saying I don’t need the money, to reiterate, i have lost everything. But maybe it’s time I down some anxiety medication see a doctor and try and play some shows y’know? There are things i can do, although it will take years, that can help myself rebuild, a huge part of me is still struggling with understanding the events of two nights ago, and where to take my life from here. This isn’t me being unappreciative. Tears stream down my face when Samantha shows me the nice messages people have written. It’s overwhelming in the most extremely nicest way that people would care about this But as I stated before, so many people have nothing they can do to rebuild their life from scratch. I have a lot to think about, I don’t even know where to start from, I just wanted to be honest. 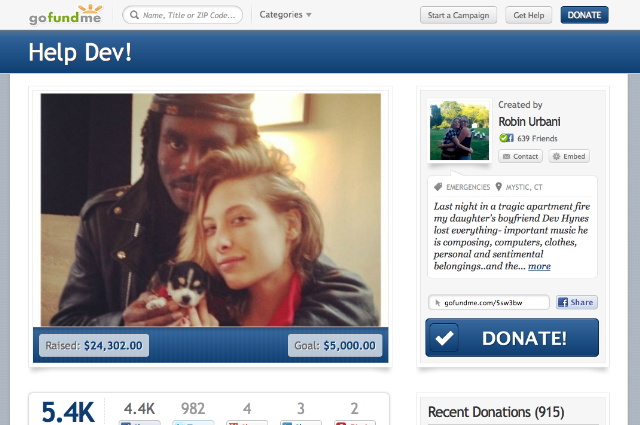 UPDATE: Robin Urbani has ended the fundraiser at Dev’s request.